On June 16, 1954, an F-86A Sabre jet piloted by Captain Clifton M. Eisele was approaching Otis AFB when the aircraft flamed out at 1,200 feet. Eisele aimed the craft towards open space between the runways before bailing out. He wasn’t injured. 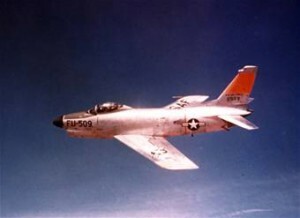 The F-86 involved with this accident was the same one used by American fighter ace Major James Jabarra in the Korean War.